Guatemala’s 15 April 2018 national referendum saw Guatemalan residents voting on taking the long standing dispute to the International Court of Justice (ICJ). Guatemala’s Supreme Electoral Tribunal and Ministry of Foreign Affairs stepped up their campaign in an attempt to ensure that as many people as possible go to the polls informed, but also motivate the vote. If the Guatemalans vote “yes” to the ICJ, pressure will come on Belize to do likewise, that is, accept ICJ arbitration, when Belize holds its own national referendum on the matter later in 2018 or early in 2019. Guatemala voted “Yes,” in the referendum, to present a longstanding border dispute between the country and neighbor Belize before the International Court of Justice (ICJ). Some 76% abstained from participating in the vote, but “Yes” managed to win 95.9% approval from the small group which turnout on Sunday. Guatemala President Jimmy Morales was pleased with the overwhelming support which greenlights a possible international resolution. Reports state that an abysmal 7-10% of Guatemala's 7.5 million eligible voters took part in the process. Supreme Electoral Tribunal president Maria Eugenia Mijangos said the voting process took place “without reports of security incidents.” Observers from 25 countries monitored the polling. Guatemala’s referendum ballot asked residents: "Do you agree that any legal claim of Guatemala against Belize on continental and insular territories and any maritime areas corresponding to those territories be submitted to the International Court of Justice for resolution?" Some Guatemalans challenged the April 15th referendum because their country’s constitution mandates that the people go to a referendum after the ICJ has made a ruling in the case and not before. Guatemalan President Jimmy Morales has called on the Latin American country's 7.5 million eligible voters to take part in a referendum on Sunday on whether the International Court of Justice (ICJ) should rule on a 200-year-old border dispute with neighboring country Belize. A final resolution could see Guatemala, a former Spanish colony, gain legal control over territory and waters currently administered by Belize, once a British colony. 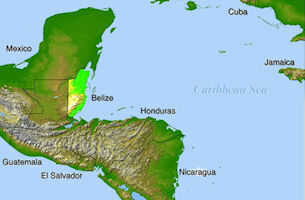 The disputed area covers some 12,270 square kilometers (4,737 square miles) — about half of Belize. The referendum is the result of a 2008 accord that would see the dispute over mainland, island and maritime territory sent to the court in The Hague, if the populations of Guatemala and Belize approve. The English-speaking Belize will hold its own referendum using the same question at an unspecified date in the future. A previous joint referendum initiative, also based on the 2008 accord, failed to take place in 2013. On April 22, 2016 Belize accused larger neighbor Guatemala of "amassing'' troops along the two countries' border following the death of a 13-year-old boy in a shooting incident apparently involving Belizean soldiers. It was a new flashpoint in a long territorial dispute between the two countries. Guatemala has an approximately 180-year-old border dispute with Belize and territorial sea disputes with Belize and Honduras. Guatemala's traditional claim has been to the half of Belizean territory that lies south of the Sibun River. The dispute between Guatemala and Belize involves Guatemalan claims to territory held by Belize. Belize had been a British crown colony since 1862 under the name of British Honduras, but Guatemala claimed the territory on the basis of Anglo-Spanish treaties in the 18th century. In 1994, three years after Guatemala recognized Belizean independence, most British troops left Belize. The British maintained a training presence until 2011, when the last British forces, except for advisers, left Belize. Guatemala disputes the 1855 Treaty with its neighbor and has re-activated its claims to half of the territory of Belize as far as the River Sibun, as well as to the reef areas (“cayes”) of Ranguana and Sapodilla (sandy islands on a Corallian sub-foundation, situated in the southern part of the Great Barrier of Belize), and as a consequence to part of the waters of the Gulf of Amatique and the Gulf of Honduras from which it is currently excluded. Territorial disputes between the UK and Guatemala delayed the independence of Belize until 1981. Guatemala refused to recognize the new nation until 1992 and the two countries are involved in an ongoing border dispute. Belize has suffered losses in its rainforest along the southern border as there have been numerous incursions with Guatemalans stripping the environment of its natural resources. Those resources range from xate leaves to gold and from rosewood trees to marine life. Guatemala persists in its territorial claim to half of Belize, but agrees to the Line of Adjacency to keep Guatemalan squatters out of Belize's forested interior. Negotiations to settle the dispute have gone on for many years. Border disputes have too long been a contentious and unnecessary barrier to economic and social development in the region. They regularly frustrate international cooperation on trade, environment protection, security, and law enforcement, and are a drain on budgets and resources. Secretary of State Colin Powell expressed US support 30 September 2002 for the resolution of a territorial dispute between Belize and Guatemala. In September 30 remarks before the Organization of American States (OAS), Powell said the approval of draft proposals to end the long-standing disagreement will be a "milestone" for the region. Powell applauded the collective leadership of Guatemala, Belize, El Salvador, Honduras and the OAS in producing the draft proposals. He also recognized the technical assistance of the Pan American Institute of Geography and History and the US National Imagery and Mapping Agency in crafting a comprehensive solution to the more than century-long bilateral disagreement. The Secretary said that the draft proposals reflected the region's commitment to peaceful dispute resolution and "are another sign that our hemisphere has come of age in common commitment to peace, prosperity and freedom." He said acceptance of the draft proposals by the people of Belize and Guatemala would "remove a chronic obstacle to economic, environmental and social development" in the countries and their neighbors. Powell added that final resolution to the territorial dispute would inspire other nations in the region to resolve their outstanding disputes. The Secretary concluded that "each time a dispute is settled, our hemisphere will become a little safer, a little freer, and a little more prosperous." Belize and Guatemala have signed an agreement 06 September 2005, brokered by the Organization of American States (OAS), aimed at deepening relations between the two countries while they continue trying to resolve a long-standing territorial dispute. In a September 6 statement, the OAS said the agreement committed the two countries to "respect and implement, with OAS assistance, a series of measures on a framework of negotiation and confidence-building measures as well as an architecture for future negotiation." Belize and Guatemala agreed in 2006 to negotiations, arranged by the Organization of the American States (OAS), on settling their claims to a maritime area that is part of a long-festering boundary dispute between the two Central American neighbors. In a 10 February 2006 statement following a meeting in Washington between officials from Guatemala and Belize, the OAS said the two countries agreed to its proposal that includes appointing a "recognized expert on the Law of the Sea" as well as inviting the government of Honduras to participate in the negotiation process. The Law of the Sea refers to a United Nations Convention that seeks to create a regime (ruling system) for the oceans. In 2008, Guatemala and Belize signed a Special Agreement to submit Guatemala’s territorial claims to the International Court of Justice (ICJ), subject to the approval of the citizens in both countries. Each country was set to hold a referendum in October 2013 to approve the agreement; however, the referenda have been postponed and a new date has not been set. 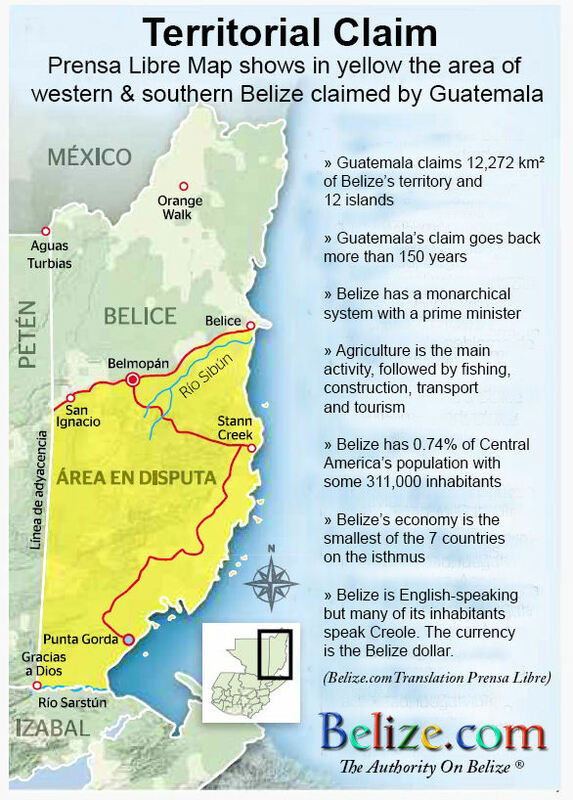 In September 2013, in his speech at the General Assembly of the United Nations, Belize’s Minister of Foreign Affairs stated that Guatemala’s claim is an “existential threat” and a constant source of anxiety to the citizens of Belize as well as to investors in the country. This issue remains largely political between both governments. In January 2014, the Foreign Ministers of both countries met in Belize to strengthen relations, plan the way forward for 2014, and enhance confidence building measures that could lead to the setting of a definite date for a referendum. The Organization of American States (OAS), which maintains an office in the “adjacency zone” of the two countries, serves as a mediator for any incidents that arise. In October 2014 the Belize-Guatemala Joint Commission agreed to thirteen measures to improve communication between the two countries as they fight transnational crime on the poorly monitored border. British Honduras faced two obstacles to independence: British reluctance until the early 1960s to allow citizens to govern themselves, and Guatemala's complete intransigence over its long- standing claim to the entire territory (Guatemala had repeatedly threatened to use force to take over British Honduras). By 1961, Britain was willing to let the colony become independent. From 1964 Britain controlled only defense, foreign affairs, internal security, and the terms and conditions of the public service. On June 1, 1973, the colony's name was changed to Belize in anticipation of independence. After 1975 Britain allowed the colonial government to internationalize its case for independence, so Belizeans participated in international diplomacy even before the area became a sovereign nation. The stalemate in the protracted negotiations between Britain and Guatemala over the future status of Belize led Belizeans to seek the international community's assistance in resolving issues associated with independence. Even after Belize became independent in 1981, however, the territorial dispute remained unsettled. At the center of Guatemala's claim was the 1859 treaty between Britain and Guatemala. From Britain's viewpoint, this treaty merely settled the boundaries of an area already under British dominion. But Guatemala later developed the view that this agreement was a treaty of cession through which Guatemala would give up its territorial claims only under certain conditions, including the construction of a road from Guatemala to the Caribbean coast. Guatemala said it would repudiate the treaty in 1884 but never followed up on the threat. The dispute appeared to have been forgotten until the 1930s, when the government of General Jorge Ubico claimed that the treaty was invalid because the road had not been constructed. Britain argued that because neither the short- lived Central American Federation (1821-39) nor Guatemala had ever exercised any authority in the area or even protested the British presence in the nineteenth century, British Honduras was clearly under British sovereignty. In its constitution of 1945, however, Guatemala stated that British Honduras was the twenty-third department of Guatemala. Since 1954 a succession of military and right-wing governments in Guatemala frequently whipped up nationalist sentiment, generally to divert attention from domestic problems. Guatemala has also periodically massed troops on the border with the country in a threatening posture.